Michael S. Stuhlbarg (born July 5, 1968), is an American theatre, movie and television actor. His most important movie roles are Larry Gopnik in A Serious Man (2009), and Griffin in Men in Black 3 (2012) . 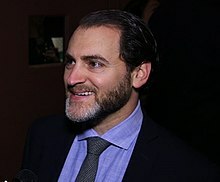 Stuhlbarg is Jewish. He recently appeared as Dr. Robert Hoffstetler/Dimitri Mosenkov in The Shape of Water (2017). ↑ "A Serious Man - Interview with Michael Stuhlbarg". The Scorecard Review.